(CNN) -- August marks the 100th anniversary of Mother Teresa's birth and few will be prouder than the citizens of her birthplace Skopje. However, such is the appeal of the world's most famous Catholic nun and humanitarian that since her death there have been diplomatic squabbles over which nation can lay claim to her. Last year, Albania called for her remains to be returned to lay alongside her mother and sister in the capital Tirana. India rejected the plea on the grounds that she was an Indian citizen. India, where she made her life's work, has made it clear that Mother Teresa, buried in the heart of Kolkata (formerly known as Calcutta), will not be leaving her final resting place. 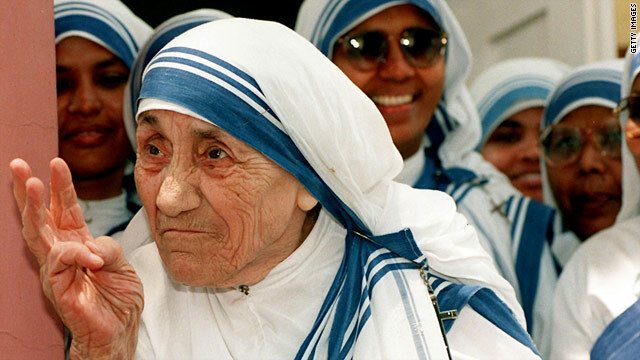 "Mother Teresa was a citizen of India," said Vishnu Prakash, spokesman for the country's external affairs ministry. Mother Teresa, however, acknowledged herself as a world citizen, saying: "By blood, I am Albanian. By citizenship, an Indian. By faith, I am a Catholic nun. As to my calling, I belong to the world. As to my heart, I belong entirely to the Heart of Jesus." At the time of her birth, August 26, 1910, Skopje was part of the Ottoman Empire, now the capital of Macedonia. By blood, I am Albanian. By citizenship, an Indian. As to my calling, I belong to the world. As to my heart, I belong entirely to the Heart of Jesus. A long-held dream for many in Skopje was realized in January last year when a memorial house was opened on the site of the Heart of Jesus Catholic Church where she was baptized and which was destroyed in the earthquake of 1963. The museum, funded by the Ministry of Culture and private donations, was opened by the Prime Minister Nikola Gruevski and the Archbishop of the Catholic Church in Macedonia, Kiro Stojanov. With so many laying claim to Mother Teresa, the memorial house is a vital reminder for Macedonians that their country played an important part in her formative years. Summing up the strong ties Macedonians feel for the modern day saint, curator of the memorial house, Andriana Spirova, told CNN: "She's a huge person from Macedonia. Macedonians are very proud." Not everyone, however, was pleased with the museum. The influential London magazine Architectural Review described the building as "hugely offensive" and a "lost architectural opportunity". It said: "It offends with its skewed selection procedure, with its pretentiousness, with its arrogance, with its tastelessness. But most of all, it offends by totally ignoring any architectural correlation with the life and work of Mother Teresa." Skopje also had a memorial plaque erected in 1998, the year after her death, on the site of Mother Teresa's family home at the edge of the city's wall. Its inscription includes her message to the world: "The world is not hungry for bread, but for love". Mother Teresa was born Agnes Gonxha Bojaxhiu to Albanian parents who lived in pop Kocina street 13, in the Vlach neighborhood of the city. The family had a long tradition in the fabric-dyeing trade, and Gonxha, the youngest of their three children, attended Catholic schools, where she enjoyed drama, literature and the church chorus. At 12, she joined an Abbey, and at 18 she left the family home in Skopje to join the Sister of Loreto, an Irish community of nuns with missions in India. After a few months' training in Dublin she was sent to India, where she took her vows as a nun in 1931. She dedicated the rest of her life to helping the poorest of the poor in Kolkata. Mother Teresa returned to Skopje four times after she left at the age of 18, according to ExploringMacedonia.com, the national tourism portal. During her first visit in 1970, as the guest of the Red Cross, she was interested in the rebuilding of Skopje after the 1963 earthquake. In 1978 she returned as guest of the city to visit relatives and neighbors of her youth. The year after receiving the Nobel Peace Prize in 1979, Mother Teresa again returned to Skopje, where she was welcomed by a large crowd and proclaimed an honorary citizen of the city. On her final visit the same year she bought a house in Skopje's central area Kisala Voka for the sisters of her Order. Mother Teresa died at the age of 87 in 1997 and was buried in the Mother House of her Order, the Missionaries of Charity in Kolkata. Six years later she was beatified by Pope John II before a crowd of 300,000 in St Peter's Square, Rome. How much do you know about Macedonia?